The following was published by dmh associate. 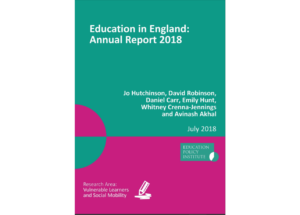 The Education in England: Annual Report 2018 considers how the disadvantage gap has changed since 2011 and how it varies across the country. The report also looks at how pupils from different backgrounds perform, and, for the first time, looks at the post-16 routes taken by disadvantaged students and their peers. The underlying causes of educational disadvantage are also examined – with several policy recommendations proposed. Pupil attainment is rising but disadvantaged children are still behind at every stage. On current trends, it will take over 100 years to close the gap in English and maths. Overall, there is little change in the gap in school attainment between disadvantaged pupils and their peers. At secondary level, the disadvantage gap across all GCSE subjects closed faster than in previous years. However the apparent narrowing of the disadvantage gap is caused largely by more disadvantaged pupils entering more ‘academic’ subjects. The TUC published a new report as part of its 150th anniversary, highlighting the challenges faced by many young people at work whose pay has hardly improved over the years and where a generational pay gap has become increasingly evident. According to their research, the ‘generational pay gap’ – the gap between the average earnings of 21-30 year-olds and 31-64 year-olds working an average 40-hour week – has increased in real terms from £3,140 in 1998 to £5,884 in 2017. That’s a total increase of £2,744 over the last two decades. Dr Deirdre Huges OBE has extracted the key points from this HECSU funded Research Project report Ms. Emily Róisín Reid, Senior Careers Consultant, University of Warwick. This project was borne out of a curious concern for the future of guidance. The instigation of new all powerful regulatory ‘Office for Students’, twinned with the impending impact of the Teaching Excellence Framework (and it’s weighting of performance indicators, such as DLHE/ Graduate Outcomes), are sizeable eruptions to the HE landscape. With HEI strategists rubbing their furrowed brows over executive boardroom-tables across the UK, the pressure and drive to results seems insurmountable. If graduate employment outcomes become the measure of the HEI throne, then ‘Employability’ becomes the Golden Fleece. ‘Employability’ is seen (by some) as the panacea to the malaises that plague HE of late such as: ‘what do students gain from coming to University?’ and ‘what is value for money?’, without them necessarily questioning: to what extent should it be? Within this heightened drive to ‘graduate outcomes’, what of the guidance practitioners: the champions of graduate gateways? Purveyors of pathways, surveyors of horizons? They who remain to the end ‘impartial’ and ‘non-directive’ – how does this ‘impartiality’ square with the challenges facing HEIs in the current marketisation of the sector? Seemingly, guidance appointments have been made shorter to accommodate the increase in need and demand for the services (Frigerio, 2010; Nijjar, 2009). However, there is a distinct lack of research in existing literature that explores or testifies as to the impact this is having on practice, and indeed, on students. This project seeks to address this lack through an exploratory study, the aim of which was to develop understanding on the impact this shortening of guidance appointments is having on practice. This was perceived to be a useful addition to the wider guidance community knowledge-base.